Random question of the moment: What was the earliest biography written in comic book form? Or rather, in comic form. Maybe a comic strip or sequential narrative mural or something. Who was the earliest subject? Wikipedia has an entry for autobiographical comics. The earliest one they cite is Mangaka Zankoku Monogatari by Shinji Nagashima circa 1961. (The article also notes that, while Justin Green is considered an autobiographical comics pioneer, Binky Brown Meets the Holy Virgin Mary didn't appear until 1972.) That surely can't be the earliest, right? Well, let's check out some other "obvious" candidates. Parents' Institute, Inc. published a book called True Comics from April 1941 until August 1950. Each issue had several, not surprisingly, true stories told in a comic format. The lead story was usually a little shy of 20 pages, and the others ranged between five and ten pages. And there we have, in the first story of the first issue, a 17-pager called "World Hero No. 1." It's a biography of Winston Churchill. 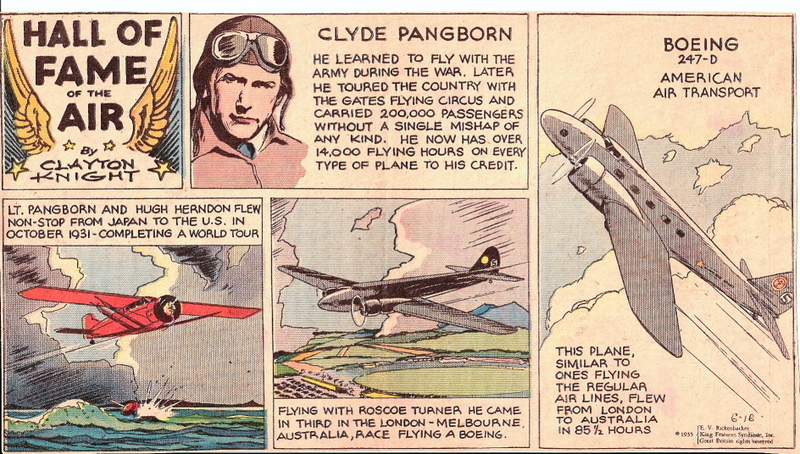 In 1935, a cartoonist by the name of Clayton Knight put out a comic strip called The Hall of Fame of the Air in which he spotlit aviators, starting with Charles Lindbergh. He only used one strip per aviator, so they're incredibly short and truncated as far as biographies go, and whether or not what he did are actual comics could be debated. Personally, I'd liken these strips to Ripley's Believe It or Not! (it debuted in 1919) which featured more quick vignettes than actual biographies. Knight's work is clearly more involved, but still seems to fall short of "biography." I can't find anything earlier. Does True Comics #1 really contain the first biography in comic form? What am I missing? On Business: There's Your Problem! On History: The Questions Have Been Terrific!